At Hi-Tech Training we pride ourselves on our commitment to quality & service. Our mission is to assist ambitious people to move up into higher paid, more secure jobs in the fields of Analogue and Digital Electronics, Alarm Installation, CCTV, Access Control and Alternative Energy Technology. Whether you are a newcomer to the field or already working in these industries, Hi-Tech Training can provide you with the specialised training so essential for success. The expert and personal guidance by fully qualified tutors is the key to our outstanding performance in the technical field. You study the subjects you enjoy, receive formal training certificates so that you are ready for that better job, better pay. All courses are very practically orientated and most incorporate approximately 50% practical “Hands-On” Training. Our experience of providing high quality technical training courses is second to none. We are committed to providing industry demanded courses. We continually update our training methods, equipment and course syllabi in order to provide participants with the skills and knowledge demanded by today’s ever changing technology. In addition we offer accredited certification from renowned qualification authorities which is recognised both nationally and internationally. A number of our training courses offer qualifications issued by the City & Guilds of London Institute. City & Guilds are one of the most prestigious examining body operating under Royal Charter. Their qualifications are recognised world wide within the technical industries and are extremely beneficial when seeking employment. Our training centre is City & Guilds approved. Successfully completing a particular combination of courses can lead to a City & Guilds Internationally recognised Diploma in IT Systems Support (7267-24). 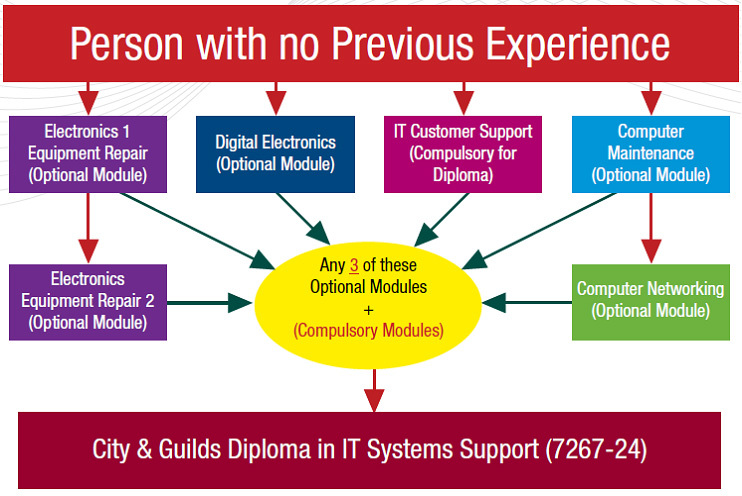 To achieve full certification for the IVQ (International Vocational Qualification) Diploma in IT Systems Support, learners must complete 4 units, comprising one core (IT Customer Support shown in Red), plus three optional units from the choice shown in the table, below. 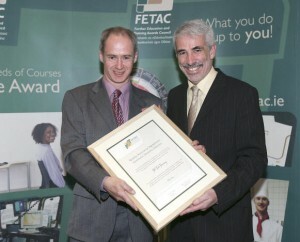 QQI…formally Further Education and Training Awards Council (FETAC) is the National awarding body for further education and training in Ireland. The certification offers people the opportunity to gain recognition for learning in education or training centres, in the work place and in the community. 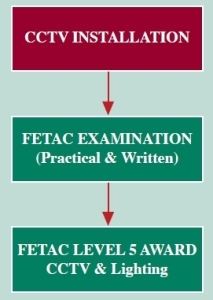 QQI…formally FETAC was set up as a statutory body on 11 June 2001 by the Minister for Education and Science under the Qualifications (Education & Training) Act, 1999. FETAC/QQI has responsibility for making awards previously made by BIM, Fáilte Ireland (CERT, FÁS, NCVA and Teagasc and has made over 1,000,000 awards to date. FETAC/QQI’s mission is to make quality assured awards in accordance with national standards within the national framework, creating opportunities for all learners in further education and training to have their achievements recognised and providing access to systematic progression pathways. Hi-Tech Training is registered with FETAC/QQI to offer programmes leading to FETAC/QQI awards in the National Framework of Qualifications (FETAC/QQI Centre Registration Number 38185D). People who successfully complete individual Hi-Tech Training courses receive Hi-Tech Training qualifications for each course successfully completed. On successful completion of a number of specific Hi-Tech Training courses, participants may progress further to obtain FETAC/QQI National Awards through Hi-Tech Training. (Photo shows Paul Coughlan MEd. from Hi-Tech Training officially receiving FETAC/QQI “Quality Assurance Agreement” Parchment from Stan McHugh, Chief Executive, FETAC in November 2007). 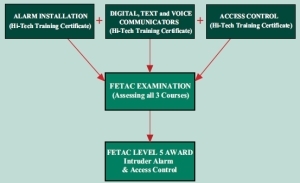 On successful completion of this course, participants may undertake a FETAC/QQI examination facilitated by Hi-Tech Training and on successful completion of same become eligible to receive the FETAC National Award – CCTV & Lighting FETAC/QQI Level 5 Component Award – 5N1771. This award can be used as one of the criteria for membership of the Security Institute of Ireland. *People with no previous electrical/electronics experience or training may need to attend an additional Preliminary Electronic Security 1 day Course. On successful completion of these courses, participants may undertake a FETAC/QQI examination facilitated by Hi-Tech Training and on successful completion of same become eligible to receive the FETAC/QQI National Award – Intruder Alarm and Access Control FETAC/QQI Level 5 Component Award – 5N1776. This award can be used as one of the criteria for membership of the Security Institute of Ireland. 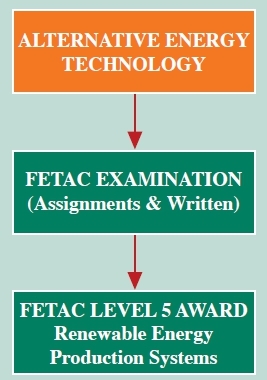 On successful completion of this course, participants may undertake a FETAC/QQI examination facilitated by Hi-Tech Training and on successful completion of same become eligible to receive the FETAC/QQI National Award – N23003 Renewable Energy Production Systems Level 5 Component.